There can be huge variances in spider size, even when they are the same age. Keeping tarantulas in extreme high or low weather, or over/underfeeding them, can drastically effect their size. Be careful when holding your spider. You do not want to harm or kill it while holding it upside down to examine it. Factors such as how much the spider eats and the temperature of its habitat can effect how quickly a tarantula matures. So the most reliable way to tell a tarantula's age (and almost the only way for female tarantulas) is by obtaining it before it reaches maturity. Tarantulas are one of the most sought-after spider pets in the world. Different genders and species of these spiders can have extreme variances in life expectancy. It's always good to get a younger spider if you want a pet that will live for a long time. Unfortunately, telling the age of tarantulas is one of the most difficult aspects of owning them. Using a few secrets of the species, however, will give you a good estimate of how old your tarantula is. Find out if your tarantula is male or female. There is a significant difference between how long males and females live. Males can live 3 to 6 years, while many females can last 30 to 40 years. Pick up your spider, and look at the underside of its abdomen. Find the area of the spider where its legs and abdomen meet. Examine the abdomen of the tarantula with a magnifying glass in a well-lit area. While some spiders' size will make it easy to see what you need to, a magnifying glass never hurts. You are looking for what are called "fusillae" -- which appear to be short, slightly bent, stiff hairs. These are very important, because the female does not have them, and they are obvious even on younger spiders. In some species of tarantulas, these "hairs" will be the same color as the surrounding area. Check for signs that your spider is mature. If the spider is male, look at its pedipalps (many consider these fangs). If these pedipalps are large and boulbous, then the tarantula has reached maturity. Also look for tibial spurs, which appear as hooks on the long segment of the tarantula's front legs, as signs of maturity. Determine the maturity of the tarantula if it is female. This is much more difficult. Spider owners often wait for the female tarantula to molt, then do a microscopic examination of its spermatheca. Most females, once they reach maturity, are two-thirds the size of their full-grown size. 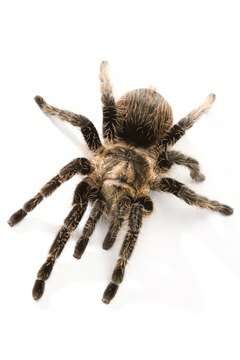 Look online for the specific species of tarantula that you own, and determine if the female is at least two-thirds its full size. If the tarantula is male and has not yet reached maturity, it may be between 2 to 5 years old. If the male tarantula does have the bodily signs that show maturity, it is most likely 4 to 6.5 years old. Male tarantulas live only for about 1 to 1.5 years after they have matured. If the tarantula is female, and has not reached maturity, its age will range from 2 to 5 years old. Once a female matures, she will continue to molt and may live another 25 to 35 years. A female that has reached maturity may be anywhere from 2 to 38 years old.